AFC East rivals will be on display in the first game of the NFL Confidence Pool Week 7 sheet as the New York Jets will square off with Tom Brady and the New England Patriots on “Thursday Night Football”. The affair is the first of many big-time clashes in Week Seven. 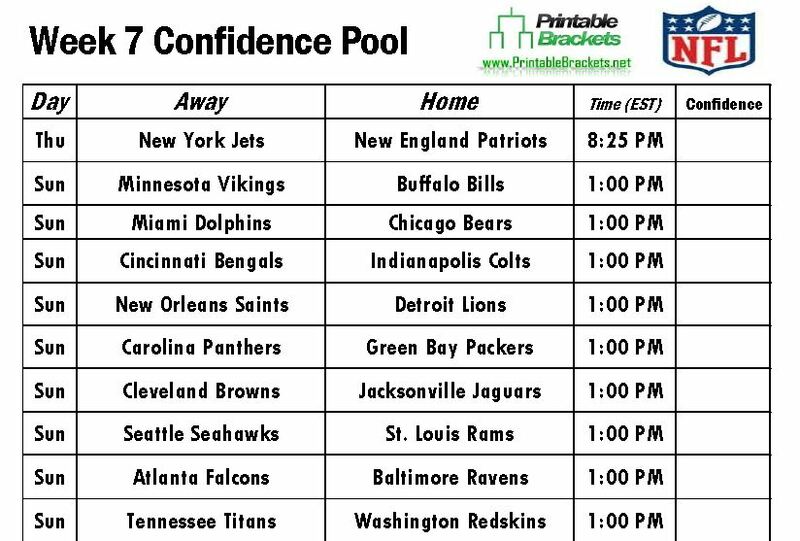 You can easily set up your office pool with the downloadable and printable NFL Confidence Pool Week 7 sheet. Additionally, you can run a standard Week 7 Pick Em pool for free courtesy of PrintableBrackets.net. The Seahawks opened the 2012 season with a 20-16 road loss to the Cardinals. The setback, however, was not a sign of things to come as rookie quarterback Russell Wilson led the Seahawks to an 11-5 record and a Wild Card berth. One of Seattle’s 11 victories was a 58-0 trouncing of Arizona in Week 14. Meanwhile, plenty of other rivals are scheduled to square off on the NFL Confidence Pool Week 8 sheet. Early tilts on Sunday include the Detroit Lions hosting the New Orleans Saints, the Carolina Panthers against the Green Bay Packers, and the Cincinnati Bengals against the Indianapolis Colts. In Sunday afternoon action on the NFL Confidence Pool Week 7 sheet, Eli Manning and the New York Giants will be in Dallas to take on Tony Romo and the Cowboys. Also late Sunday, the San Diego Chargers will host the Kansas City Chiefs. Sunday’s action wraps up with Colin Kaepernick and the San Francisco 49ers meeting Peyton Manning and the Denver Broncos on “Sunday Night Football”. The only teams that have a bye in Week 7 are the Philadelphia Eagles and the Tampa Bay Buccaneers.